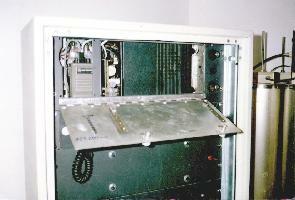 The first 147.320 repeater was a ground-up effort, built entirely from components typically referred to as "junk". The original repeater was made from two HT's, with a VIC-20 computer running a control program written in BASIC. The duplexers were (and still are) a set of North Shore units, put together from a kit from around 1973 and bought at a hamfest in New Hamphshire in 1990. 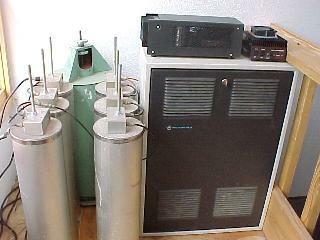 This "system" was put on the air not long after I moved to Albuquerque in late 1991. During the 1992-1993 time frame, I put together a repeater using more "serious" parts, still mostly scrounged but assembled in such a way as to make reliability a main feature. To date, after 7 years of operation the only failures have been two rectifier bridges in the power supply, the thermal sensor for the fan and the external 10M amplifier. Until last year it had always been at the same location, Al, K7YAM's garage, with the antennas on the roof. It has enjoyed both a rise and fall in popularity in the past years, but with 10M activity increasing, the opportunity to work 10M DX via this 2M remote base should attract more users. Even recently I've worked New Zealand, Australia, the Carribbean and most of the US east coast. It's pretty neat to be chatting on 2M and hear DX appear calling CQ. Hit the touch-tone enable code and work 'em! There are, never have, and never will be any club organization, dues or memberships. This repeater, like the web site you're reading this on, is free and open for everyone to enjoy. 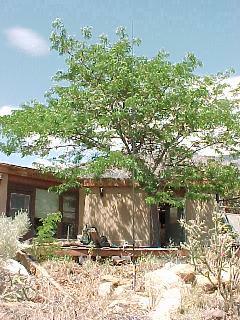 as it appeared in 1993. The homebrew control matrix. and 2M Hustler at original site. 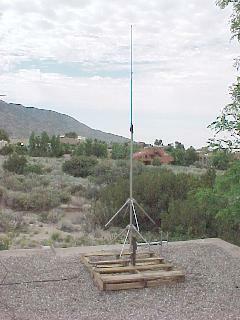 In July 1999 the repeater was moved from it's site of 7 or so years to a location about a mile north. The main reason for this move was a source of constant "grunge" from an unknown source. I've always wanted to move the repeater to allow me to run more power (if I used more than about 10 watts it messed up the old site owner's TV set), and gain access to a phone line. After meeting with my friend Tom N5YYE, it was determined that his home offered a nearly perfect location, and plans were set into motion. 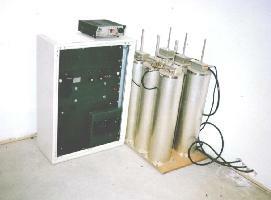 On March 6, 1999 the 2M repeater returned to the workshop for repairs and retrofits before the move. The first order of business was to fix the inoperative receive PL. During times of severe grunge the PL could be turned on (via front panel toggle switch), but it never responed to the proper PL signals. Troubleshooting revealed the switch was bad! Never expected a switch with just a few dozen cycles to fail, but I guess I was the lucky one. Now, after YEARS of having to listen to everyone WHINE about the audio on the repeater, I built an audio equalizer to bring up the low end a bit to make up for the brute-force L-C PL filter in the Micor. 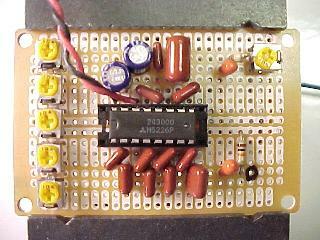 This circuit originally appeared in the May 1990 issue of QST Magazine, "An Audio Equalizer for Communications Use" by Robin Rumbolt, WA4TEM. 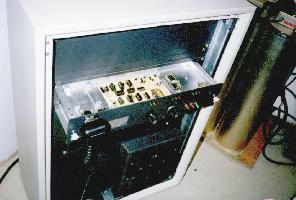 The heart of the circuit, a Mitsubishi P/N 5226P was still available in 1998 at of all places, Radio Shack. (RSU #10873545) The other parts, all passives, were obtained from Digi-Key or my junk box. It's a 5 band equalizer that has 10dB adjustable bands within the 100-3000 Hz audio band. I boosted the lows and highs, cut the mids a bit and when swept revealed a pretty flat passband. For a simple "in, out and ground" building block, it makes a great addition to any link or repeater. [CLICK HERE] to see more details. The antenna with the radials is a Hy-Gain, with the 440 link yagi mounted directly below it. 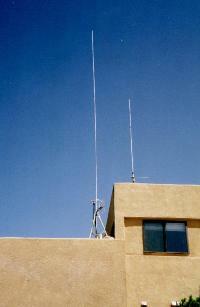 The photo on the right shows the Cushcraft 10M remote base vertical, which is set up in the back yard. Since the repeater is pretty close to the the antennas, 3 short runs of RG-8X "Mini-8" coax were all that were needed. After all the exercise of refurbishing and moving it, the repeater still suffers a bit of occasional grunge, but not nearly as much as at the previous site. The reduction in interference, and the addition of a phone line for the patch still made the effort worth it. With the repeater in this stable state, I can now focus efforts on the *NEW* 147.320 repeater, which is just getting underway in the workshop.